Carlisle 1492. Lora O'Shea is in trouble. Sent to England to gain the release of her worthless husband, Lora soon finds herself accused of witchcraft and bound to a stake. Daniel Sinclair risks his life to save Lora from the flames. Entranced by the Irish lass with haunting eyes, Daniel learns that, only if Lora successfully gains her husband's release and returns him to Ireland, will she regain custody of her daughter. Daniel longs to banish the misery in Lora's life and shower her with kindness. Treachery, deceit, the threat of rebellion and a daring plan stir the lives of all involved. Daniel and Lora thwart the fearsome Raven in his scheme to pitch England into turmoil. 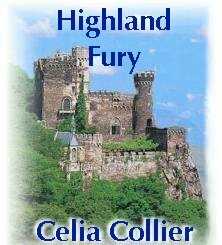 There, on the windswept cliffs of Ireland, Daniel and Lora discover a love that captures the soul; a love borne from Highland Fury.